How volunteers came together to copy the acclaimed novel "To Kill a Mockingbird" word-for-word with ONE PENCIL. It began May 4, 2007 at the Hollidaysburg Area Public Library and concluded on June 6. 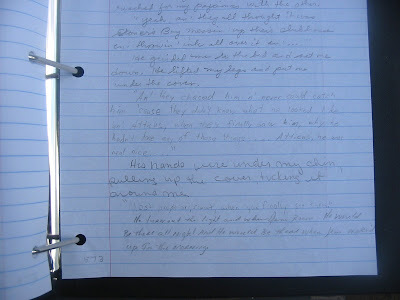 Click here to read a GREAT entry about To Write a Mockingbird at the Discover.com blog—the DiscoBlog! Chief webhead at DISCOVER sends props! been so happy to found out that we were wrong. from the quoted section in the upper-right of the blog. Congratuations on your record-setting triumph. Thanks, Mr. K, for the kind words and for suggesting the link! It's now in place, just where you suggested. We look forward to reading your blog. Readers: Find Amos Kenigsberg blogging here. That's our final count of the words in To Kill a Mockingbird. 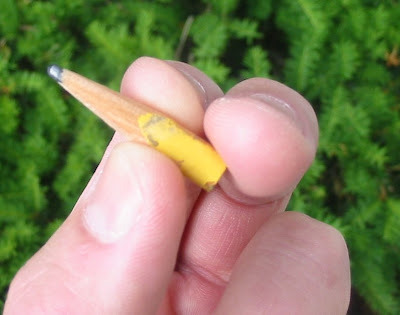 Our pencil copied every last one. This includes the title "To Kill a Mockingbird" and the Section Titles "Part One" and "Part Two." It takes in 405 pages of text in this edition, for an average of just about 248 words per page. Our copying consumed 573 sheets of paper, giving an average of about 175 words copied per page. We involved 26 volunteers for the first 32 continuous hours, copying about 32,000 words. 5 volunteers completed the task over the course of the following 4 weeks, in approximately 60 more hours. Probably more when you include the task of counting the words. Please note that OUR count was 100,388 words. We feel this is accurate within 500 words. It's possible that another count would be different simply due to human error, as well as to different choices about how to count words, particulary hyphenated words or uses of dialect or common speech. For example, how many words would you count in each of the following uses? 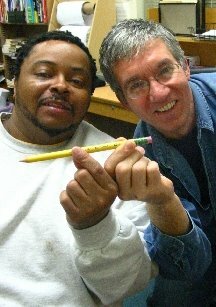 Anyway, we've reached our major goal and intend to retire the pencil. It certainly has more words left in it, but it's fought the good fight and we want to have enough left to display in the library! Actually, our original goal was simply to test the claim in Discover magazine that the average pencil can write 45,000 words. We're amazed to have written well more than double that number. This entire project has been a challenge, a blast and a grind. It was wonderful to join with many volunteers and to amuse and surprise those hearing our story. We hope to do more pencil events, involve many more people and draw more attention to the Hollidaysburg Area Public Library and it's soon-to-launch building campaign. See? You never know what might be going on down at the library! P.S. This may sound like a final post, but it's not. What for updates! We're still finishing the word count. For now, please enjoy these pictures. More facts and figures will follow. 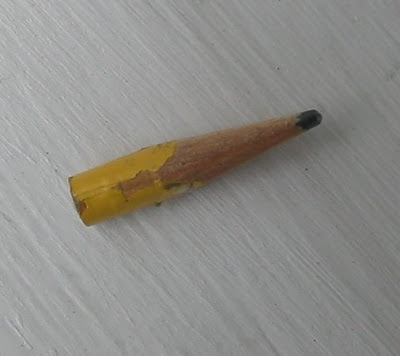 The pencil in the "Bi-conderoga" mode that allows writing with a stub: The metal ferrule of another pencil joins the stub to an unsharpened pencil, and the combination is stabilized with tape and a splint (the shaft of a cotton swab). The official final length: 1-3/16 inches (or 1.219 inches). 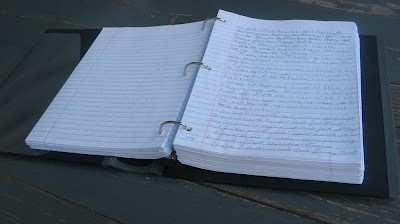 The completed manuscript has 573 sheets of paper and is 2" thick. And did we ever put the "manual" in manuscript! The final page, written by five different volunteers. We expect to finish copying the ENTIRE BOOK by tonight! We've copied through page 393, and the story ends halfway through page 407. Only 14 more pages to go! We're shooting to finish the actual word count by tomorrow. We reached a count of 75,000 words on page 307. Text actually starts on page 3, so that makes 305 pages of text, for an words-per-page average of just about 246. We've copied through page 370, so our latest estimated word count is 370 x 246 words, or 91,020. Note: That would be more than double the number of words (45,000) that Discover magazine said we could expect from the pencil. 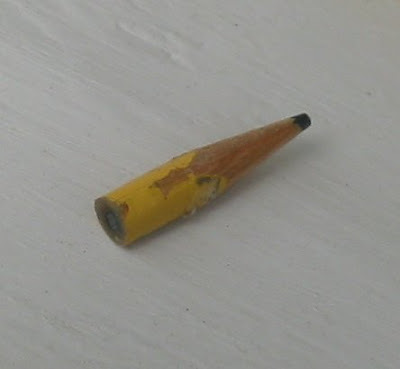 The pencil is harder to measure now, taped up as it is in the Biconderoga (not to mention splinted for stability) but its length is about 1.25"
We've passed page 300 in the book and have once again outpaced the counting of the words. Using the last words-per-page average that we calculated (249 words per page) gives an estimate of around 75,000 words. Just to be conservative for now, it's safe to say that we've blown by 70,000 words. 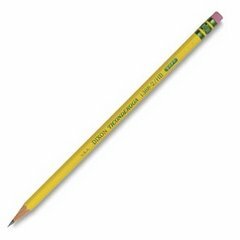 The average pencil holds enough graphite to draw a line about 35 miles long or to write roughly 45,000 words. History does not record anyone testing this statistic. Organizers Kenneth Sheppard (left below) and Keith Eldred gathered a group of twenty-six copyists to honor the noble themes of To Kill a Mockingbird.